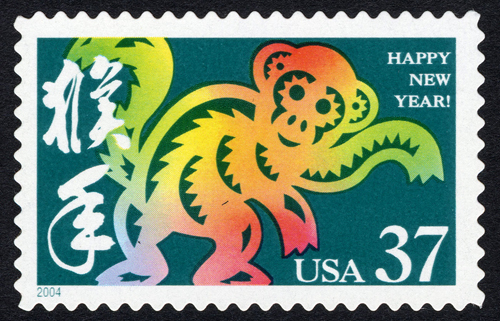 On Feb. 5, the United States Postal Service (USPS) issued its Year of the Monkey stamp. 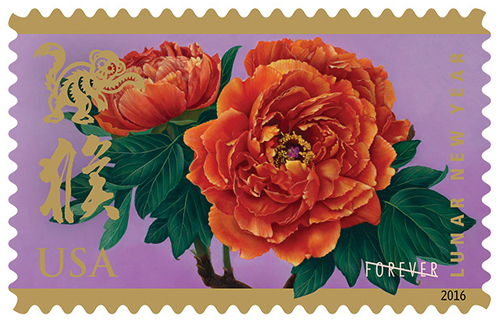 The stamp art features two bright reddish-orange peonies against a purple background. Peonies symbolize wealth and honor in Chinese culture and often decorate the sides of the traditional drums played during the holiday festivities. 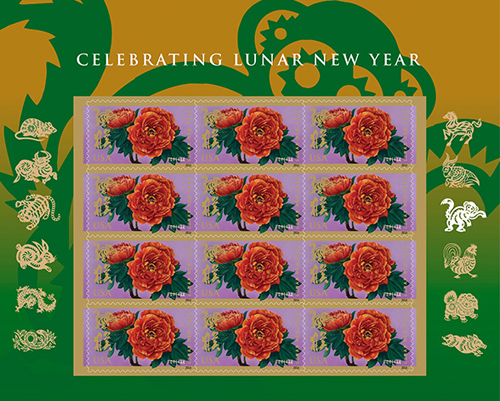 Art director and stamp designer Ethel Kessler incorporated elements from previous series of Lunar New Year stamps — Clarence Lee’s intricate paper-cut design of a monkey and the Chinese character for “monkey,” drawn in grass-style calligraphy by Lau Bun — to create continuity between the series. The monkey is one of the 12 zodiac animal signs associated with the Chinese lunar calendar. According to an old legend, the animals raced across a river to determine their order in the cycle. The rat crossed by riding on the back of the ox, jumping ahead at the last minute to win the race. Next came the ox, then the tiger, rabbit, dragon, snake, horse, and ram, followed by the monkey in ninth place. Which version of the monkey stamp do you like better? The 2004 or the 2016?